Greeciversary! Woohooo, we have been waiting for this for, like, ever! haha First stop on our big Greece trip was in Corfu where we stayed for three nights. Corfu is one of the biggest Greek islands. We easily could have stayed there a week exploring all of the little villages. We stayed along the northeastern coast in Dassia at Kaloudis Studios & Apartments. I don't usually like to name where we stay because most of the time it isn't anything to brag about, but this place was great! We had a two bedroom apartment, and the owner was the sweetest lady! She was so helpful is telling us where to go, how to drive the roads, and we even got maid service everyday which is unusual for apartments. Corfu was a terrific introduction to Greece for us - great choice, Eric! The four of us had trouble meeting at the same time on our first day due to limited flights for Luke and I, and Becca and Eric's long-haul flight from the United States. Becca and Eric arrived mid-day after two stops along the way from Houston, while Luke and I arrived at night after a direct flight (so spoiled!). Note: That was the Buisson's first time flying out of Luton Airport, and it was interesting. 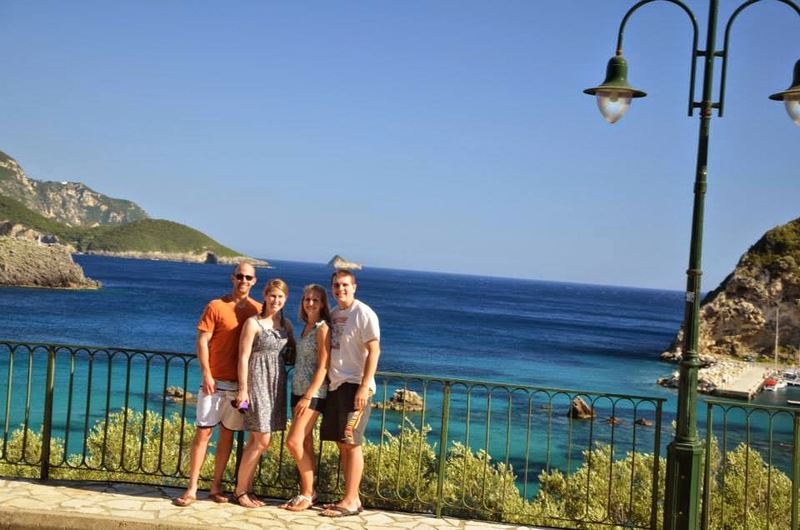 While Becca and Eric waited for us to get to Corfu, they ran some arrival errands such as getting groceries, rented a car, learned about some island details, and checked out the nearest beach and town. They picked us up from the airport in the car, and we went straight to Corfu Town for the next few hours to hang out, explore, have dinner (at Salto Wine Bar), and have drinks. Somehow, the two of them stayed up until 1:00 am that night even though they barely slept on their flight. On Thursday, Luke and I woke up and purposely made quite a bit of racket in the kitchen to wake up the jet-laggers which worked quite well :-) We started off the morning going to the beach near our apartment. The water was really cold (Corfu had the coldest waters of our trip), so we mostly sat on the beach in the sun. This was where the jokes of Debbie being a walking ghost began - in my defense, I was wearing Baby sunscreen and that stuff is like wearing clothes! We had lots to explore so we decided to move on to other parts of the island. In order to do so, we had to drive there. And in order to drive there, Eric needed to get up a hill out of our apartment. This was no easy task! Eric had not driven a manual since he was practically in high school, so he was very rusty. The problem with this hill was that once we made it to the top, we would be sitting in the crossroad which was a very busy road, and there was nowhere to pull over. It was quite scary! Video here, (I warn you that there is loud Zalewski cackling involved). We safely made it up the hill and out into traffic - phew! Although, we made jokes about Eric's skills, we are so very thankful for his ability because none of us knew how to drive! If it weren't for him, I don't think any of us would have seen the sign for a certain town that makes us giggle - Fukami - oh, and we would not have seen half of what we saw on the island. So thank you thank you thank you, Eric, for driving us for three days!! Our first destination around the island was Paleokastritsa. Rated on Trip Advisor as the #1 beach in Corfu, the area has two coves across the street from each other. One cove had a very small beach area, it was quite windy, and it was pretty rocky. Eric and Luke went out to explore and take pictures from the rocks while Becca and I chatted on the beach. After an accidental hole in a beer resulting in one of us shot-gunning said beer, we drove along making several stops along the way as the views were amazing! During one of our stops, we heard loud music coming from below and saw people swimming in the water. We were very interested to know about this party, so we headed down a long set of stairs. La Grotta is a bar built into the cliff which includes a diving board, crystal clear water for swimming, and area to jump off the cliff. Luke and I sat back and watched as Eric dove off the board and jumped off the cliff. Afterward, Eric convinced Becca to jump together for their ten year anniversary. I guess it takes ten years for people to jump off of a cliff because Luke and I were NOT going to do that! The four of us were getting quite hungry so we moved along the coast. We kept getting higher and higher. Naturally, the views kept getting better and better! We eventually decided to turn around and go back down, but it just so happened that we decided to turn around where a little old man was selling bottles of... something. We figured it was wine, so yeah, let's buy some! This man knew zero English, and we were having a difficult time communicating to him what we wanted. Red wine? One? White wine? One? That wasn't working, and we were one hand shake away from purchasing ALL of the bottles. We finally communicated enough to get just two of the red and one of the white. Phew! Luckily, the two red were actually red wine, but the white bottle was olive oil - oops! After the wine exchange, we found a spot along the beach to eat dinner (at Akron). The positive to being American and eating early is there is no one else eating with you - it was so peaceful, yummy, and we got to watch the sunset! After dinner, we headed back to the apartment, walked along the beach, had a few more drinks, then went to bed. On Friday, we woke up as early as possible because we had much more ground to cover on the island for our last full day. We drove to the northern coast all the way to the northwestern tip. Because of a mountain on the northern half of Corfu, the driving routes can be tricky. 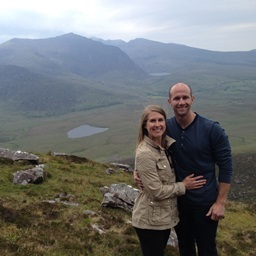 We made several stops as we drove to take some pictures and also take in the stunning scenery. We were so close to the coast of Albania that we actually picked up Albanian mobile service. The hills out in the water in these next two pictures are in Albania. Our first beach stop on Friday was at Kalami beach. It was a fairly quiet beach, and the rocks on this beach were really big. It was a bit uncomfortable to lay on at first, but in the end, it felt more like a massage. Moving along, we made more stops for views. We could then really see Albania, and even the town that we could have visited by ferry if we had chosen to spend a day in another country. We saved the two best things for last! Islands have such amazing rock formations, and it is amazing how they are gradually changing each second. The first of the neat formations we saw was on accident actually. We missed a turn, which took us to... a place with no name. Seriously. I dont know the name of it, but it is sooooo cool and pretty! Just look at it! Heading back to where we were supposed to go, we made the correct turn this time toward Canal D'Amour in Sidari. Legend has it that if you and your partner swim through a certain hole in a certain rock, the two of you will get married. Well good thing we were all already married because it was windy and the water was not safe for swimming. But the rock formation was quite impressive! We had quite a long drive back to Dassia after that. We all chatted with drinks on the patio for a while to relax. For dinner, we went to Leonidas right across from our apartment which was one of the best meals we had in all of Greece. It was super cheap, not in any way fancy, but it was so good! The best are the hole-in-the-walls, right? On Saturday, Becca and Eric got up and went Parasailing (click here for full video). Then we all hopped on the bus into Corfu Town. We said one last goodbye to the Corfu waters before we walked to the airport to fly to Athens. With a population just over 100,000 people, Corfu is located in the Ionion Sea.